Eminem is one of the greatest rappers of all time, and there is really no debating it. Having had one of the most successful runs in music history in the early 2000’s, Slim Shady’s popularity in the mainstream was matched by his sheer technical prowess on the microphone. However, in recent years many have said that Em is washed up and doesn’t have it anymore. They cite the poor critical and commercial performances of his post Recovery albums, and his creative direction as indicators that Eminem is no longer a threat in hip-hop. Then Shady dropped the full length album, Kamikaze, unannounced on August 31, 2018, and the entire rap game was instantly on notice. Calling out all of his critics, the album is a blistering rebuttal to all the rumors of Em’s demise while also offering his feelings about the current state of hip-hop. The song “Lucky You” is the third track off that album, and features a guest verse from rapper Lucas Joyner. The track was also the first off the album to receive a music video, which was released on September 12, 2018. 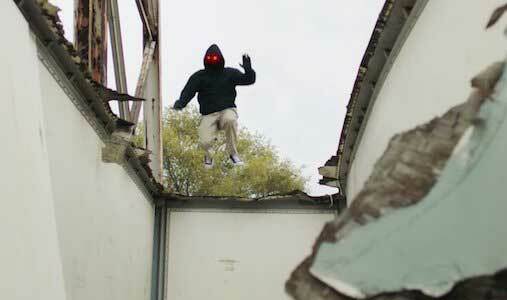 An army of hooded figures wears black chucks in this video. The song is, much like most of Kamikaze, Eminem lamenting over the current state of hip-hop. He goes over his dislike of how everyone has fallen into the same type of flows and rhymes schemes, highlighting mumble rap as a prime example. He states that while he doesn’t hate on trap music in general, the lack of originality when it comes to mumble and party rappers frustrates him to no end. He also calls out the industry’s over reliance on ghost writers as a major issue. Joyner gets in on this sentiment as well, and actually holds his own with Em with some nice lines of his own. Overall, this track is non stop shots from the greatest to ever pick up a mic, and shows that Em has no problem starting beef with any of today’s current crop of talent. These figures have glowing red eyes, and hunt down both Eminem and Lucas Joyner. The music video begins with Em and Joyner in a dark, dingy bunker. They emerge in what looks like post-apocalyptic Detroit. Decked out in combat gear, Joyner starts off his verse with plenty of anger and vitriol. 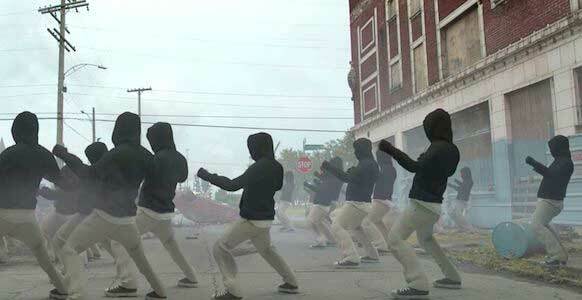 However, an army of red-eyed, shadow-faced individuals emerges from the rubble of the city wearing black hoodies, khaki pants, and black chucks. As Joyner finishes up his verse, the army gets bigger and bigger. Eminem then comes in with his verse, and the army of faceless drones surrounds them, waving their arms in a frenzied motion. Midway through his verse though, Em notices that the army is just mimicking what he and Joyner do. This plays in perfectly with the song's message about how everyone in hip-hop is just doing the same thing, and no longer cares about being different or standing out. Em then goes into hyperdrive on his verse, which sends the copycats flying through the air. This video just goes to show that everyone follows the GOAT (greatest of all time), and with Em back in top form, everybody in hip-hop should be scared. Surrounded by an army of imitators. Use the links below to get yourself a new pair of GOAT chucks.